Stars Over Washington: Is This the Natal Horoscope of Senator Bernie Sanders? Is This the Natal Horoscope of Senator Bernie Sanders? 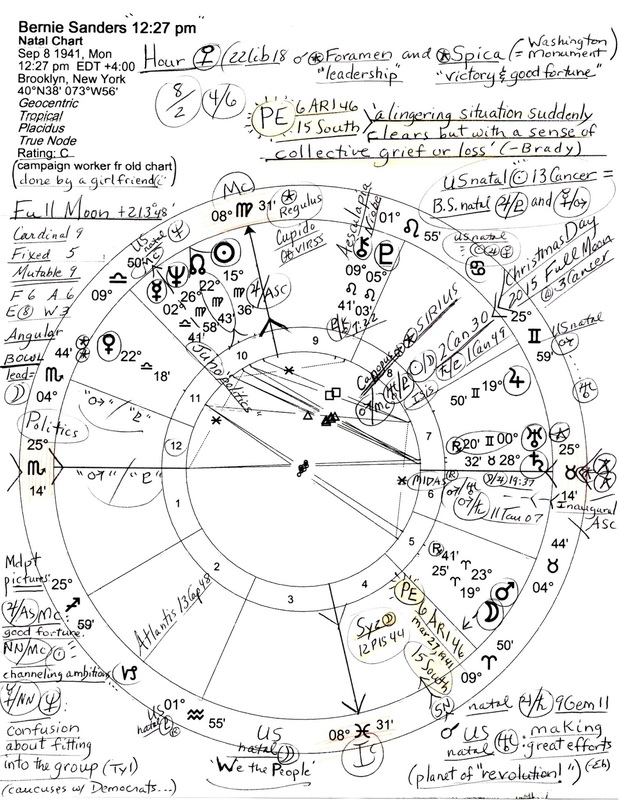 Many thanks to my FB friend Sara Jayara for cluing me in to the fact that there is a possible known birth hour for Senator Bernie Sanders based on a glimpse of a natal chart done for him years ago by a girlfriend. 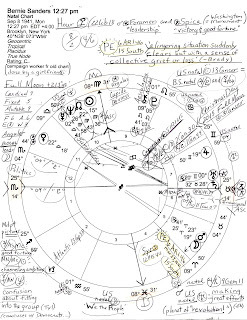 If fixed Scorpio is indeed rising, his rigidity of purpose concerning Scorpionic issues (corporations, big business, money including hidden funds, taxes, surveillance, etc) through the years makes sense though of course many other factors must be considered. In Astrology, rectification of a chart and time is quite a laborious task and one must know life events of the native and their timing in order to make a success of it. Since my study and blogging schedule was shortened by circumstances in 2012, rectification time is what I do not have so I'm posting my penned-upon version of said chart (September 8, 1941 12:27 pm EDT Brooklyn, NY King's County) for your consideration and for my future reference. In Leo is his Pluto-Chiron conjunction of Plutocracy, oppression, and Socialism (and other -isms in royal Leo which may help explain the Scorpio-related emphasis of his political career. Ideology, philosophy, and higher education are the areas where his Pluto-Chiron energies most easily express (natal 9th house.) Plus, you see his full 10th house of Career and Public Standing expressed on Capitol Hill in the US Senate, not the usual job for very many of us. Opposite our Moon in the 18-28 Leo range, the senator has quite a few important midpoints beginning at 21Leo and ending with 29Leo (conjunct royal star Regulus, so prominent in the natal chart of Donald Trump). They are: Venus-Jupiter, Pluto-MC, Sun-Pluto, Saturn-ASC, Sun-Chiron, Uranus-ASC, and Pluto-NN--and all may be applied on various levels to Politics. Yet having links via opposition to the US Moon isn't as powerful an indicator in an election (most US presidents have had such a link--Barack Obama's comes through his Leo placements) as conjunctions in Aquarius would be but for those voters who prefer Bernie Sanders for president, Leo placements may become significant on November 8, 2016 along with such connections as voting North Node @10Virgo, a Jupiterian point of union and public contact, conjunct his natal Midheaven (The Goal and Aspiration Point.) Natal Sun, NN, Neptune, and Mercury @2Lib41 (conjunct US natal MC 00Libra) are wonderful placements for a senator and if his 10th house Neptune doesn't interfere come Election Day 2016, it will be because the planet of compassion supplies a spiritual link that inspires and uplifts the American people and allows the senator wide popularity with the masses. Of course it isn't as if I believe the 2016 Election vote count will be honest! Personally I go by the "it's not the votes that count, it's who counts the votes" philosophy in American Politics. Plus, it will take a massive turn-out of Democratic voters to override the election fraud, gerrymandering antics, and other dirty tricks certain operatives have planned for Election Day for a Democrat to win the White House even though a landslide turn-out of voters may be just what helps crash our antiquated voting machines into oblivion as the old order of 1776 comes to a screeching and anarchist-engineered halt. Hopefully not.